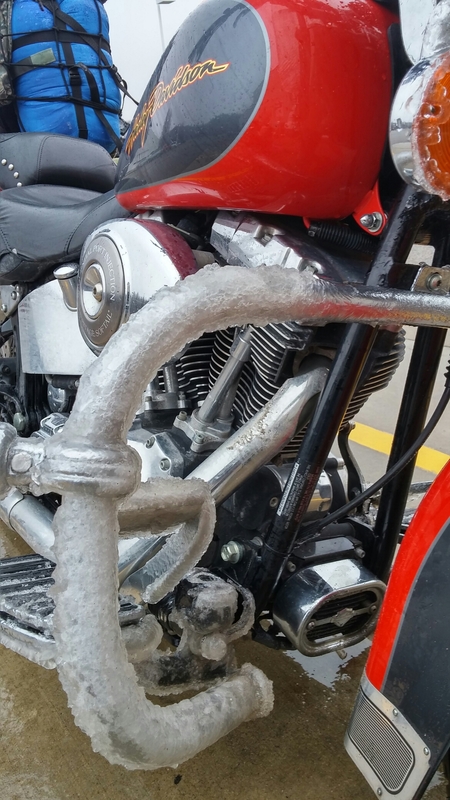 As a half-inch of ice covers my little world, I find myself walking past my motorcycle in the garage wondering if it will ever see sunlight again. I know it will, but at the end of November it feels like a warm(er) day of riding is a long way from today. 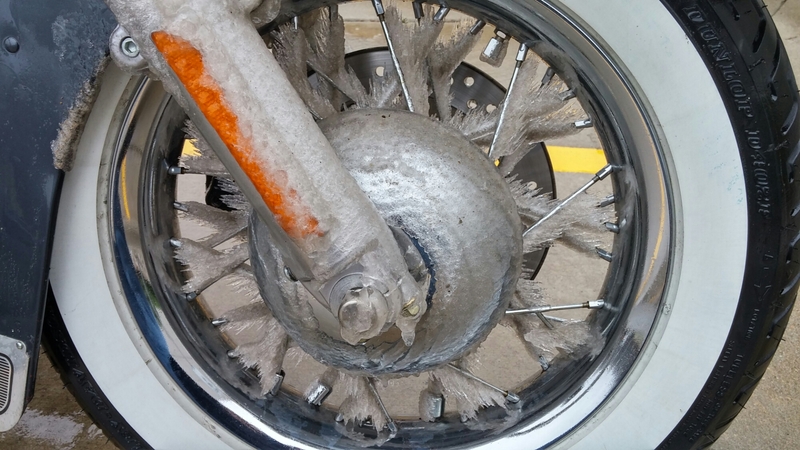 I have been known to ride through the dark days of winter and as long as it’s not dangerous, I can put up with cold temperatures. I draw the line however, at dangerous or soon-to-be dangerous roads. There are too many things out of my control when dealing with the weather and those other folks that have their hands on the steering wheel sharing my little piece of asphalt. Like pulling up a chair in Vegas at the blackjack table you have to know when to hold’em and know when to fold’em. Ice? I fold’em. So when I ran into the owner of this motorcycle, I had to question his sanity. He left central Missouri on his way to York Nebraska for Thanksgiving, stopping just long enough to warm up and make a phone call or two. It was on the Wednesday before the holiday and it was cold and over-cast but dry. He said he was returning on Saturday, and me being a junior meteorologists and the proud owner of a crystal ball, I told him there was no way he would be riding back on Saturday. He proved me wrong, but he also proved me right at the same time. I was wrong about him coming back by on Saturday, but I was right about how riding in the winter is all about mental fortitude. He was soaked through and through. His leather jacket and insulated bib overalls were heavy with drizzle and his gloves were dripping from the ice that was melting on them. He was in high spirits considering his situation. As for me, I would have pulled over long before I got to this point. Not that I don’t have the fortitude to ride in the cold, and for that matter I feel I would have been a little more prepared by wearing a proper rain suit. But the roads were only going to get worse and the traffic was heavy due to the holiday. In other words, not a good hand at the blackjack table and it was not a good bet to continue on. So after a handshake and a pat on his shoulder wishing him a safe trip, he climbed aboard his bike and took off heading east with another 3-4 hours of road ahead of him. Knowing he would arrive at his destination after dark, I knew the worst was yet to come for him. 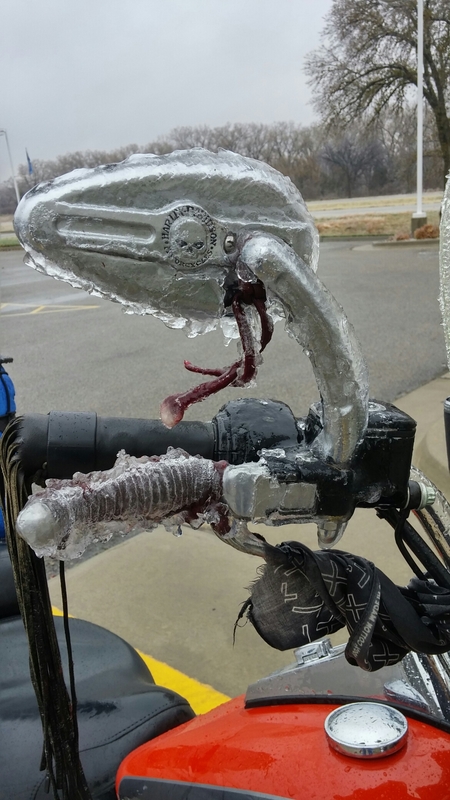 The glare from the headlights off the icy windshield and his full-face helmet would be sketchy at best and all of this while being tired and cold. I hope he made it safely. I hope he knows that complete strangers were worried about him. I hope he knows how dangerous it was to be doing this. I know one thing for sure. He made a promise to me on Wednesday that he would return, and he did. A man of his word – and I have a feeling he made someone else a promise that he would make it home safe and sound. Safe travels my friend and I know we’ll meet again. As always, Jeff, what a well written post. Motorcycling is an inherently dangerous lifestyle. Most of us have put ourselves in less than preferable situations on our bikes. I know I have, on and off road. Riding at night, solo, tired, through bad weather, in unfamiliar territory, over deer-infested roads: I’ve done all of those things and more. Gotta be somewhere and can’t stop. In the end, it’s the rider who has to measure his or her experience against the individual circumstance. And what he or she has to lose. And decide what’s right at that time. Those pictures!! I cannot imagine! 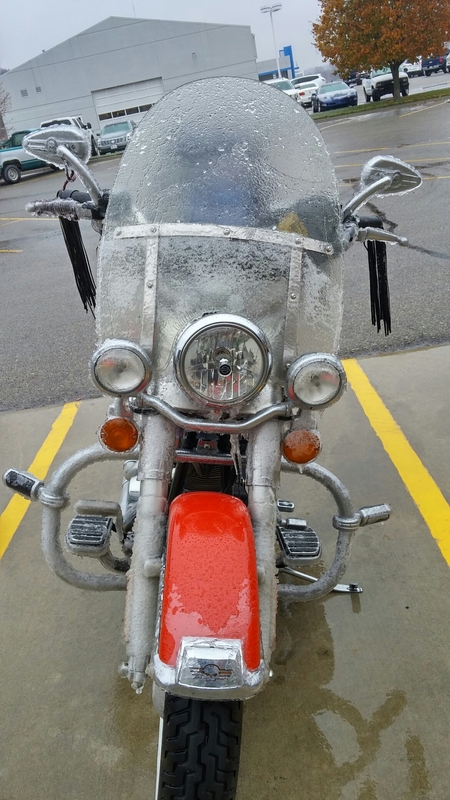 I’ve ridden in freezing temps and soaking rains, but never ice. I’m so glad you let us know that he kept his promise and returned! Still can’t BELIEVE this fella. Do you wish you had taken his number or email to check in on him? Just crazy. I do wish I would have had him call or email me when he got home. As much as we talked I’m surprised we didn’t make that arraignment….yeah I would have called it a day long before I got half-way.